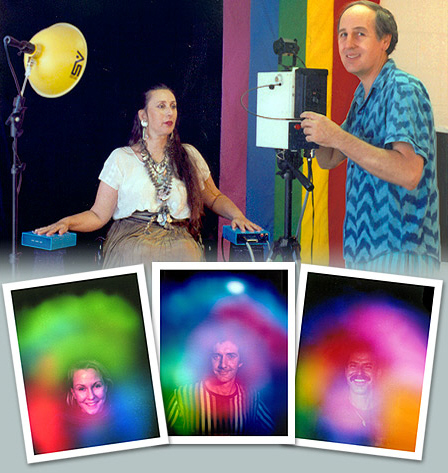 Aura Photography is based on the understanding of modern research and the knowledge of cultures for milleniums. The technical measurement and display of the vibrations from the client and his radiance is an objective representation of body, soul and mind. Aura photography allows us to reproduce the colored radiant aura and opens new possibilities of perception for our inner worlds. The human being is a complex unit of body, emotion, mind and spirit and this is reflected in his aura field. Your actual physical body is only a small part of your true self. We are made of energy that permeates every layer of our being. This energy, which permeates the body and extends out from it at various lengths, and can change according to our moods, health and spiritual character, is commonly known as the Aura. Every person has an aura. Each colour has its general characteristics. These can be positive, constructive or negative and destructive. The aura changes constantly but may have a predominant colour in the emotional and causal layers. The way the aura is perceived can vary greatly from person to person, depending on the energy level of the person at the time. Please make a booking in advance.